Together feels like a labor of love. It’s full of details that add depth and texture without adding complexity. The story is never boring, but it’s never exciting, harrowing, or hilarious, either. Together is a quiet, simple movie, best appreciated by an attentive, emotionally receptive audience. Chun (Tang Yun) is 13 years old. His mother left when he was only two, and the one thing she left for him was a violin. He picked it up at three and started winning competitions at five. 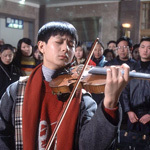 Now he’s ready to travel with his father to Beijing to try out for a spot at the conservatory. The audition goes as well as it possibly could, but without the yuan to grease some palms, and without a music teacher to sponsor him, Chun loses his spot to less deserving but richer boys. Chun, however, is not so interested in fame. He plays for fun and to remind himself of his mother. He would gladly give it up to please his friend Lili (Chen Hong), an older woman and Chun’s first crush. Chun eventually wins a spot with Professor Yu (played by the director), a cold, heartless teacher. His other pupil is a little girl, whom he pushes aside for Chun, who shows more promise. This is the cutthroat world of classical music and prodigy-creation, happiness be damned. Kaige spends much of his energy developing the characters. In addition to the boy and his father we get to know many characters intimately. Chun befriends a woman named Lili. She’s a golddigger and a moll. Judging from the pictures he hides in his sheet music, she is just his type. Luckily, she takes a shine to the kid and pays him to play for her now and again. It struck me that we get to see the homes of each of these characters. Jiang keeps cats in his funky, cheap apartment, while Yu’s home is neat and tidy. Lili’s apartment looks like it was decorated by an American teenager, with phone numbers written on the mirror in lipstick. Anybody Chun knows well, we know well. This attention to detail shows itself in other ways, too. There is a single shot of Chun’s dad going to work as a skyscraper window-washer. It’s only one shot and it probably cost Kaige a half a day’s labor, but it was important enough to show the texture that Kaige filmed it. Because the movie is so well crafted, it’s a shame not to recommend it more highly. The trouble is that Kaige’s style is too soft-spoken. Together never moved me to tears or raucous laughter or tense fear. It was touching and funny, but in a very subdued, subtle way. The funniest joke was the snoring of boys at the flophouse in glorious surround sound. The touching ending features a wonderful recital and a storytelling device that only works in the movies — a concert that happens in two places at once. Together is enjoyable enough, but unless you’re ready for a quiet, simple movie, you may miss its appeal. Save this one for a rental when you’re ready for something more meditative than explosive.